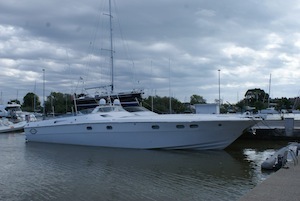 Wonderful Magnum jealously maintained, just equipped with new 1550 Hp MAN. 320 Lt total consumption at cruise speed of 33 knots. Refit 2014-2015: new engines – new exhausts – complete rebuilt of electrical and hydraulic system – new interiors – all batteries new – new hydraulic gangway – all exterior towels new. Ready to sail! Actually in a winter storage hangar 5 minutes from Rome’s Airport (Italy) ready for a visit on board.